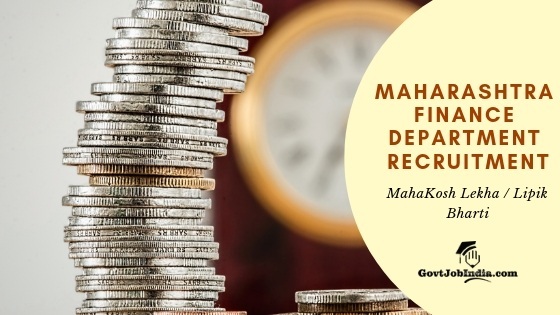 MahaKosh Bharti 2019: The Maharashtra Finance Department has released the Mahakosh Accounting Clerk / Audit Clerk and Junior Auditor/Junior Accountant Recruitment 2019. This Maharashtra Finance Department Bharti is part of the Maharashtra government’s Mega Bharti effort. Eligible candidates can now apply online for the लेखा लिपिक/ लेखा परीक्षा लिपिक आणि कनिष्ठ लेखापाल/ कनिष्ठ लेखा परीक्षक Bharti 2019 on the Mahapariksha website @ mahapariksha.gov.in. All interested candidates are requested that they send in their Mahakosh Recruitment Online application form for the post of Accounting Clerk / Audit Clerk and Junior Auditor/Junior Accountant before the last date on 29th February 2019. The Maharashtra Finance Department Group 1 / Group 2 Recruitment is offering candidates to work with the महाराष्ट्र वित्त विभाग in their offices in the following regions. Candidates who are looking for a govt job in Maharashtra must Apply Online for this fabulous opportunity provided by the Maharashtra Govt. right away. The MahaKosh recruitment application dates are active from 29th December 2018 to 29th January 2019. Further details regarding Maharashtra Finance department Recruitment 2019 are provided below. Make sure you check out the Mahakosh Accounting Clerk / Audit Clerk and Group 2 Junior Auditor/Junior Accountant Application fees, salary, education qualification and other important information. The Age relaxation applicable to reserved candidates will be as per the schemes of the Maharashtra Govt. Check out the table provided below for the Age relaxation applicable for Maharashtra Finance Department recruitment 2019. Candidates would need a certificate from a recognized institute/organization regarding the basic knowledge of computers. The Maharashtra Lekha Lipik Bharti 2019 selection procedure comprises just 1 stage as mentioned below. Please note that details regarding the exam date will be present on our page for Maharashtra Finance Department Admit Card 2019. Candidates should first register on the Mahapariksha portal. Once you have registered, you will then be able to start filling your Mahakosh Group 1 and Group 2 Application Form. Once the candidates have filled the application form carefully, you can then proceed to pay your Online Application fees. This fees can be paid through Online payment methods. These include credit card, Debit card and net banking. After the fees are paid, your application process is successfully completed. Don’t forget to apply online for DAT Maharashtra Finance Department Recruitment 2019 before the last date on 29th January 2019. The Mahakosh Accounting Clerk / Audit Clerk and Junior Auditor/Junior Accountant Recruitment can be the start of a long and successful career in the Maharashtra Government. You can ask us all your queries in the comment section below. Our team will help you out with any doubts that you may have. I fill the form from finance department for the post of account clerk and junior clerk . Now i want to printout of that form but there is no such login for printout. please solve my query. Were you able to get an e receipt after you paid the exam fee? If so you should take a print out of that e receipt as evidence of application. There should ideally also be an email sent to you on your registered email id regarding the e receipt. Since your question is about the Application form, there are a couple of things that you can check out. Hopefully, your problem will be solved. 1. Check your email inbox and see if Mahapariksha has sent you a link where you will be able to find your application form. 2. Go back to Mahapariksha and Log in to your registered id and check if there is a facility that will help you check your application form. Ideally, there should be a system which tracks your recent applications. Hopefully, you should be able to find your application form through one of these means. If you are still facing trouble the don’t hesitate to communicate with us here. Alternatively, you can also talk to the authorities at Mahapariksha about your problem.